The closest major airport is Salt Lake City International Airport is 309 miles North of the park. The Saint George Airport is 46 miles South of Zion National Park. 1. Take I-15 South to Exit 40 to Zion National Park. 2. Or continue South on I-15 to Exit 27 onto Stateroad 17 East to Stateroad 9 to Zion. 3. Or continue South on I-15 to Exit 16 onto Stateroad 9 East to Zion. 1. Take I-70 West to I-15 South and then follow one of the three directions above. 2. Take I-70 West to Exit 48 onto Highway 89 South to Stateroad 9 West to Zion. 1. Head to I-15 North or South and follow the North or South directions to the park. 1. Head to I-15 North to Exit 16 onto Stateroad 9 East to the park. 2. 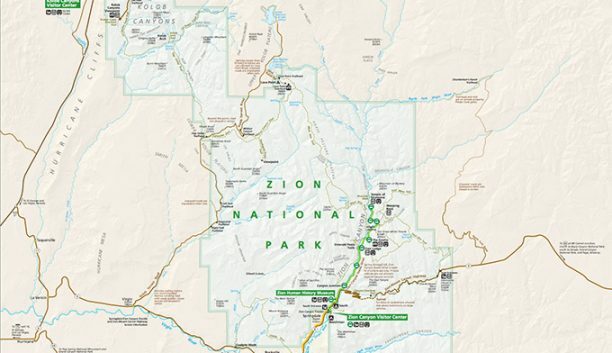 Head to Highway 89 North to Stateroad 9 West to Zion.